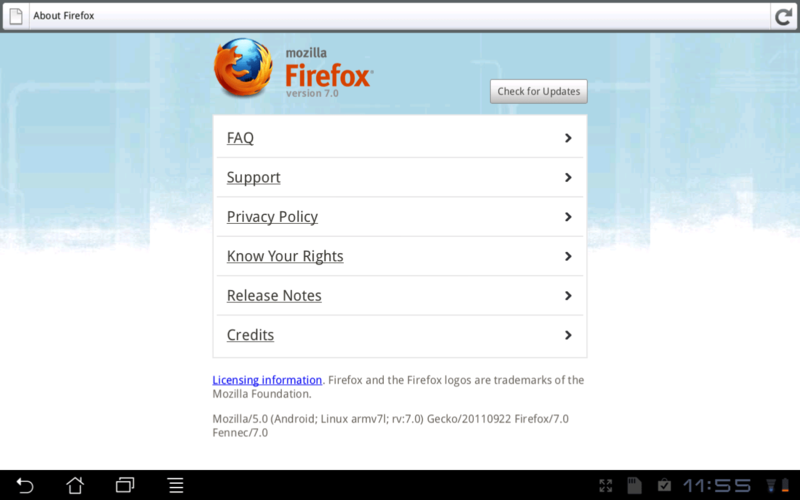 With the amount of updates coming out of Mozilla Labs, it would seem as if none of the developers are sleeping. A few minutes ago I was suddenly prompted to update my browser to yet another solid number. The full range of their products has been upgraded. I upgraded my mobile version first because frankly I can’t find anything new about it, so it should be some higher level optimization since nothing has changed aesthetically. For the mobile browser though I was expecting complete tablet optimization and desktop user identification but it has yet to surface. Of course an update is almost always good… it brings with it a number of bugfixes and tweaks that help make the overall experience so much better. Although I half-expected something more from a whole number version jump.